Odorless, non-staining and very effective against the ticks that may cause Lyme Disease. 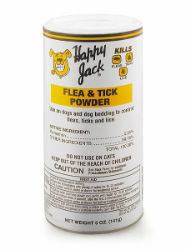 Flea & Tick Powder may also be used to dust the bedding, kennel, sleeping quarters, carpeting, and furniture regularly used by infested animals. For area dusting, apply at a rate of 3-6 ounces for every 100 square feet. Use as often as once per week. Provides quick killing action and residual control of fleas and ticks on dogs for up to 14 days.